Add high-performance next generation RFID and 1D/2D barcode scanning to the mobile devices of today and tomorrow — simply, easily and cost-effectively. Just pair the Bluetooth-enabled RFD8500 with a compatible Zebra or third-party mobile device and you’re ready to go. 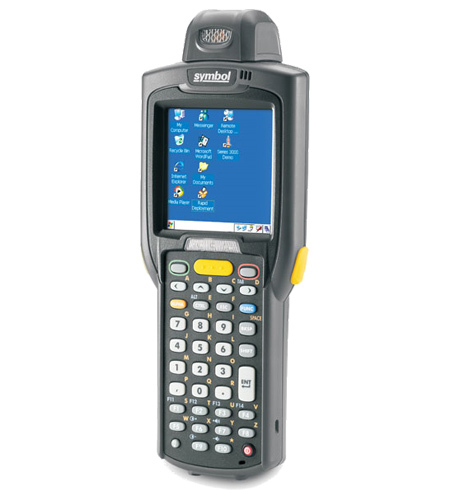 You can attach the mobile device to the RFD8500 sled for a complete one-piece solution — or workers can put the mobile device in a pocket and use the RFD8500 in standalone mode.The new Zebra DS9808 presentation scanner from Zebra continues the legacy of the successful MX2000: high flexibility and a modern design with advanced technology. It scans 1D, 2D and PDF417 bar codes at tremendous speeds of up to 254 cm per second. Using the DS9808’s optimised hands-free mode, users can scan even the most bulky and heavy items effortlessly, making it perfect for retail applications, especially during peak hours. The Zebra DS9808 is a Zebra scanner with an attractive exterior design. It is just as suitable for retail environments, like boutiques and electronics shops, as for demanding environments in laboratories or pharmacuetical manufacturers. Its slim stand also makes it suitable for places with limited space. The modern scanner body holds a fully functional omnidirectional scanner that reads bar codes from any direction at high speeds (up to 254 cm/sec.) – even badly printed, torn and uneven codes. For different scanning ranges, a 2D standard-range (SR) imager with up to 27 cm range and a long-range (LR) engine with laser and imager with up to 46 cm range are available. The DS9808 reads all commercial 1D, 2D and PDF417 bar codes. A resolution of up to 5 dots/mm (120 dpi) even makes professional scanning of pictures and signatures possible. It scans and decodes even the tiniest codes and images on ID cards and driving licences in the wink of an eye. This makes the DS9808 ideal for applications that have age restrictions or collect data for customer systems. At the same time, it is extremely comfortable to use. Precision scans are still possible under the worst lighting conditions, e.g. bright sunlight. A loud acoustic signal and an extra-large LED indicate every completed scan. Optionally, the DS9808 is also available with integrated EAS deactivator. The scanner reads the bar codes and deactivates the security tags fully automatically, saving users further steps. The device is equipped with a multi interface (keyboard wedge, RS232, USB) for unlimited applications. Harsh conditions are no problem as well – it withstands drop tests onto concrete from a height of 1.5 m without any damage. Its attractive design in black makes it the perfect choice for a modern POS as well as production environments.